The Auschwitz-Birkenau concentration camp complex, established by German Nazis in 1940, one of the most infamous sites in Europe, saw the deaths of nearly 1.5 million people, most of whom were European Jews. The complex comprises the Auschwitz I camp and the Birkenau (or Auschwitz II) camp with a total of about 150 buildings and 300 ruins. Auschwitz was only partially destroyed by fleeing Nazis when the camp was liberated, so you are able to see many of the original brick buildings as you walk around. Visitors pass through the iron gates crowned with the infamous motto „Arbeit macht frei” („Work makes [you] free”). The Wieliczka Salt Mine (Polish: Kopalnia soli Wieliczka), located in the town of Wieliczka in southern Poland, lies within the Kraków metropolitan area. The mine, built in the 13th century, produced table salt continuously until 2007, as one of the world’s oldest salt mines still in operation. 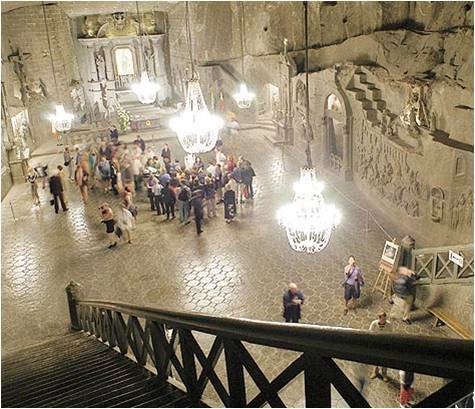 From its beginning and throughout its existence, the Royal mine was run by the Żupy krakowskie Salt Mines, believed to be the world’s 14th-oldest company. Commercial mining was discontinued in 1996 due to low salt prices and mine flooding. In 1978 it was placed on the original UNESCO list of the World Heritage Sites. Even the crystals of the chandeliers are made from rock salt that has been dissolved and reconstituted to achieve a clear, glass-like appearance. It also houses a private rehabilitation and wellness complex. Attention! Time is subject to change. Wawel is an architectural complex erected over many centuries atop a limestone outcrop on the left bank of the Vistula River in Kraków, Poland, at an altitude of 228 metres above the sea level. It is a place of great significance to the Polish people as up until 1611 it was a formal residence of Polish Kings. It is because Cracow was the capital city of Crown of the Kingdom of Poland and later The Polish–Lithuanian Commonwealth. The Royal Castle with an armoury and the Cathedral are situated on the Wawel hill from which the castle took its name. Polish Royalty and many distinguished Poles are interred in the Wawel Cathedral where Royal coronations were conducted. Some of the oldest masonary parts of Wawel, such as the Serene Virgin Mary Rotunda dates back to 970. There are also some wooden parts of the complex that date over century earlier to about IX century.